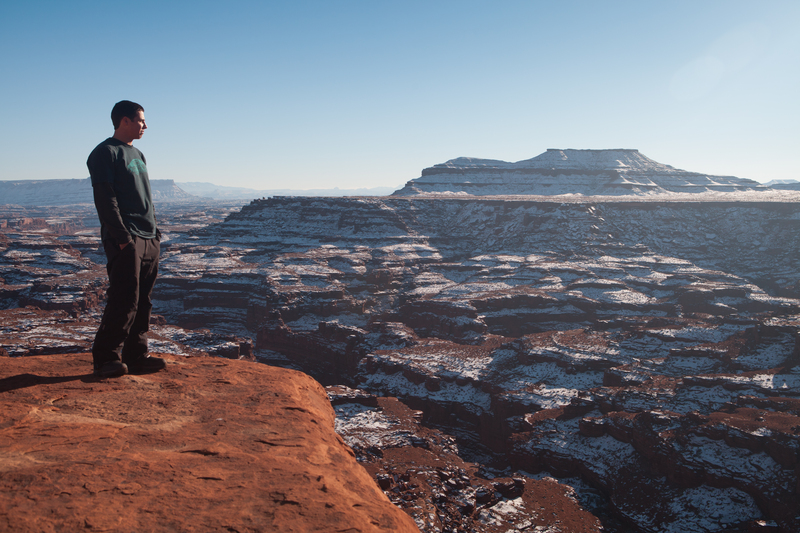 White Rim Trail is among the most beautiful trails in the Southwest. It is also one of the most remote. The Trail follows the contour of a secondary mesa 1,200 feet below the surface edge of the Island in the Sky, taking visitors deep into the guts of our planet. 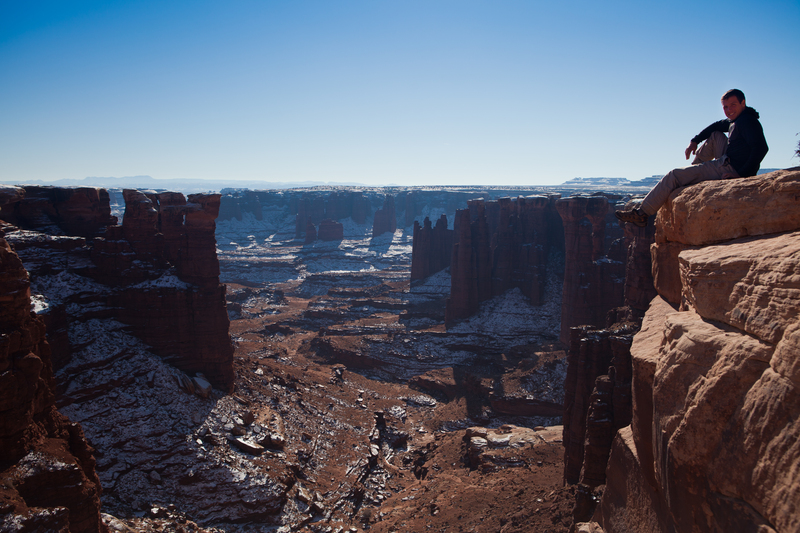 At every turn, the trail reveals grand-scale geological formations, from buttes and towering walls, to capriciously carved rock formations, arches and the windblown sandstone layers that give the trail its name. Wherever one looks, there is nothing but impassable wilderness that meanders down through cliffs and canyons to the most isolated sections of the Green and Colorado rivers. 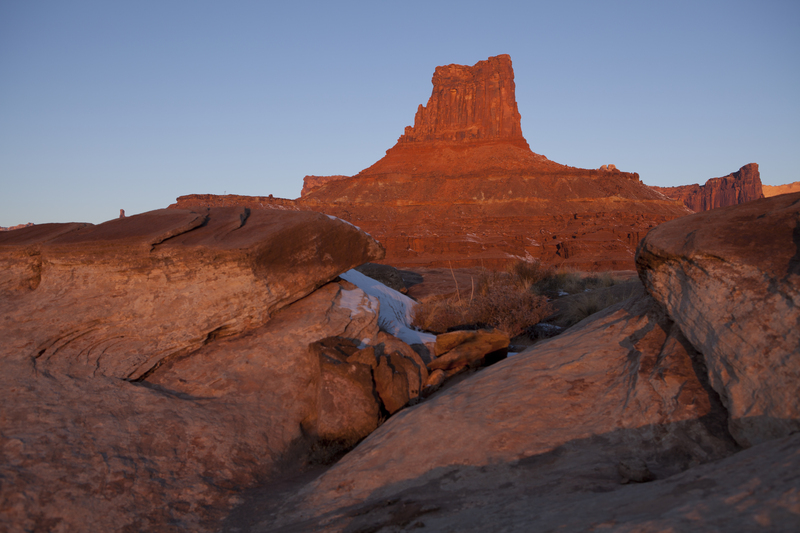 The Trail today is part of Canyonlands National park, but the history of the trail precedes the establishment of the area in 1964 as a National Park. The White Rim area was pioneered by cattle herders in the mid 1800’s and later explored by John Wesley Powell. A mining boom in the 1950’s brought uranium prospectors to the region that created a network of roads and mines that, ultimately, did not produce much ore. The Trail is a product of this period. White Rim Trail is about 100 miles long and is considered moderately difficult for high-clearance four-wheel-drive vehicles. The trail offers a superb mountain biking experience. There are two very steep sections, Shafer Trail, which provides access from the East, and Mineral Bottom, which provides access from the West. Both trails are often closed during the winter season as a result of ice buildup and mud. 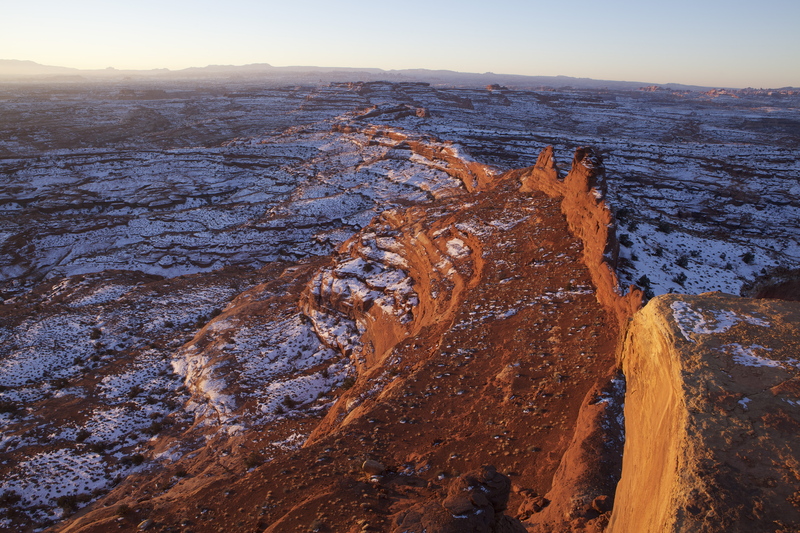 When these access sections are closed, one can enter the Trail through a much safer route, Potash Road, a 13 mile high-clearance road that merges with the White Rim trail at the foot of Shafer trail. Shafer Trail. Impassable in January due to icing conditions. I have traveled the trail twice during winter in unfavorable weather conditions. My most recent visit was on January 2013, when the area suffered one of the coldest winters on record. Both access points were closed. Other sections of the trail that do not get enough direct sunlight to melt surface ice, such as Murphy Basin and Hardscrabble, forced us to turn around and not risk the possibility of losing the vehicles. As a general rule, the eastern part of the trail gets more sunlight than the western section making icing conditions less critical all the way up to Murphy Basin. It is possible to take the Murphy Basin trail section heading on an eastern direction, but climbing Hardscrabble thereafter may not be possible forcing a return to Murphy Basin heading west, a considerable difficult road climb under slippery conditions. Camping along the trail is highly regulated and permits are required. One must reserve campgrounds and stick to an itinerary. The strict rules and regulations imposed on visitors traveling the Trail makes the experience a bit restrictive, considering the extreme isolation of the area. The “leave no trace behind” practice is taken to the limits. However, I appreciate the fact that, to preserve this exceptional place, exceptional measures are required. It is likely that one can spend 3 days on the trail without seeing a single visitor. This place is an isolated, precious piece of heaven on Earth and provides an opportunity for the preservation of a pristine desert environment for future generations to enjoy and study. If you are mountain-biking or off-roading, the Trail needs a minimum of three days to be best experienced. The scale of the landscape, the color of the rocks and the orientation of the trail create an unequalled stage to enjoy the sunrise and sunset. Everyday is a color feast. It is also a place for exploration. 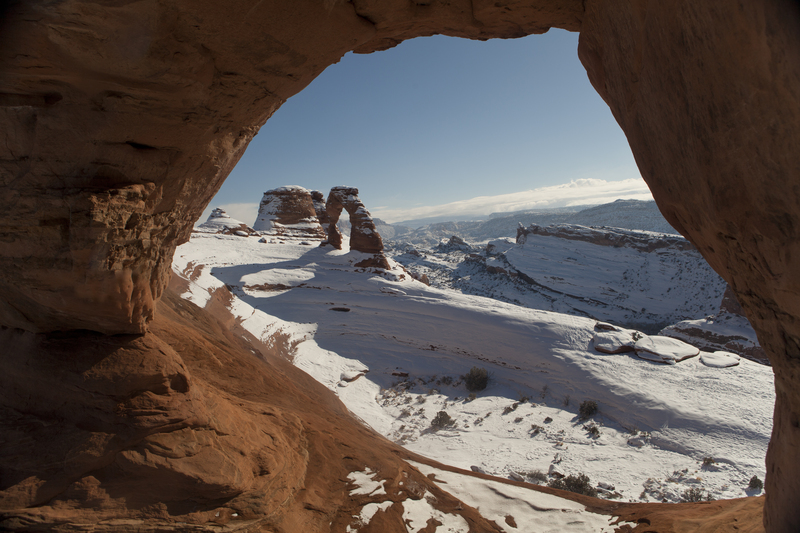 There are a few primitive trails that take you into geological pages dating back 300 million years, when Utah sat close to the Equator. Perhaps, the most memorable place along the trail is the Lower Basin overlook, just 500 feet south of White Crack, a set of gold-colored sandstone boulders clinging on to the edge of a 1,000 foot cliff with a view in every direction. View of Lower Basin from the White Crack overlook. Another memorable spot is Monument Basin, four miles northeast of White Crack. This fantastical landscape resembles the architecture of Antonio Gaudi’s Sacred Family, or a set of a science fiction movie. I tried to find a trailhead to get down to the bottom of the canyon to get closer to the towering columns below, but apparently there is no access to the basin from this point. The thing that strikes me as disappointing about White Rim is the poor quality of the campgrounds. This is an area of development for the Park to resolve. The campgrounds are mere parking lots with little, if any, aesthetic regard for the visitor experience. It is hard to believe that the four or five campgrounds along the trail couldn’t be located in more suitable (and beautiful) locations. Other than White Crack, the campgrounds are ugly. Having said that, the bathrooms are impeccably clean and so are the grounds. Don’t underestimate Potash Road. The views along the road to the evaporation ponds include breathtaking views of Pyramid Butte, the Colorado River and the La Sal Mountains. 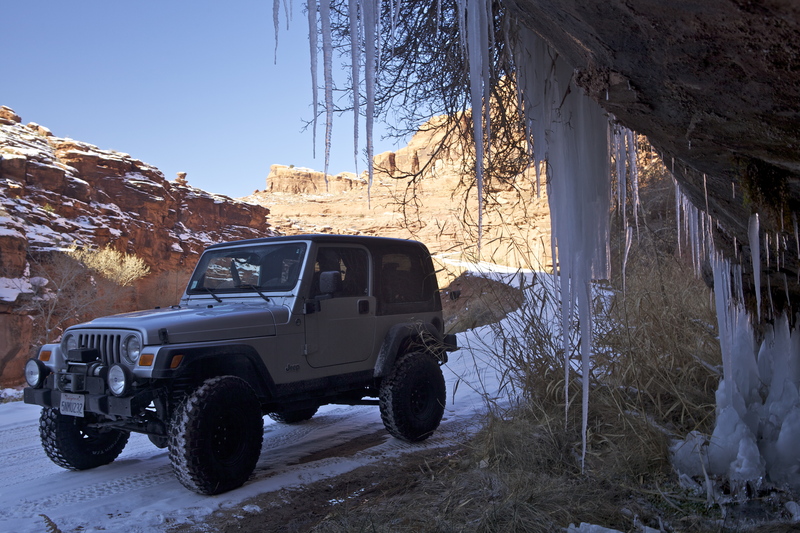 The road back to Moab is pleasant and offers a few attractions worth checking out. 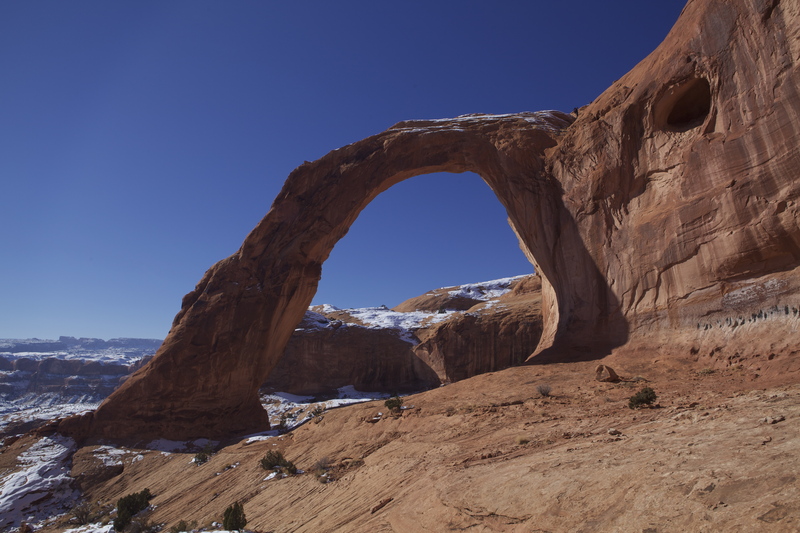 The Corona arch is a beautiful site easily reached by a short trail. This arch rises over 140 feet high with a huge opening. I’ve seen the town of Moab grow through the years, but on my last visit I sensed that it has come into its own. New boutique hotels and restaurants have opened and are doing a great job. We stayed at a small B&B called Cali Cochitta, ran by two lovely people who understand hospitality and comfort. 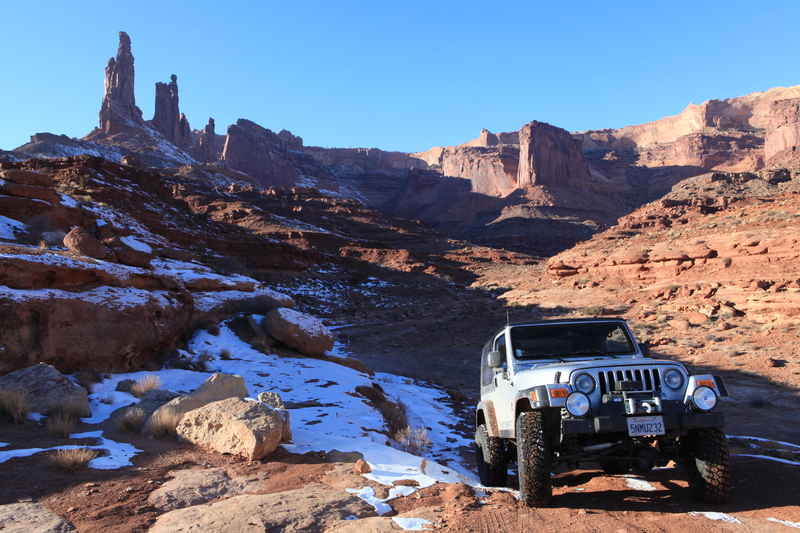 This was a great place to arrive to after a few days camping on the White Rim Trail in freezing temperatures. Unforgivable to be in the area and not pay a visit to Delicate Arch, one of the most iconic geological objects in the world. As much as it is seen on postcards and editorial features, nothing compares to seeing it live. The freezing temperatures kept me from climbing to its base, it was dangerously slippery, but I got close enough to recognize what keeps me coming back over and over again to this part of the world. Delicate Arch. Arches National Park. This entry was posted in Travel and tagged Canyonlands, Four Wheel Drive, Island in the Sky, Moab, Utah, White Rim Road, White Rim Trail on January 20, 2013 by agusgarza.